The newest addition to the Total Wine family will be opening its doors this Thursday. The new location at 8851 SW 136th St, Miami is located right across from The Falls Mall in the Pinecrest area of Miami. This has been a long time coming and a welcomed addition to the area. Stop by all week and check out their massive selection and sample some of their wares as they will have lots of tasting going on through out the week. 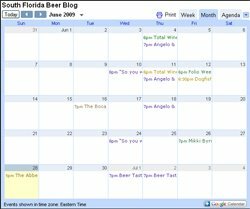 Tell them South Florida Beer Blog sent you! On Sunday, I saw a sign on the door that said they were opening on 8/17, which is Wednesday. Yes, the old CompUSA building is the new TOtal Wine and More. I am not sure how many of you have been to one of these, but they are my favorite place to buy beer. They have isles and isles of beer. Not only do they have a lot of it, the employees at the one near me are very knowledgeable and love to help you find new beer. After seeing this article I am reminded that I need to go back and find a few new beers. Thanks for the reminder, even though that wasnt the intention.